Find the perfect perch in any of our Stools! 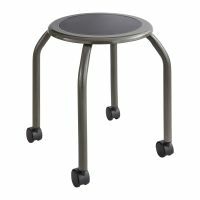 Mobile Stools are great to scoot around the office, school, or lab when you need to get from one desk to another quickly. Maybe you�re pulling something off a printer right behind you or just checking on some lab results down at the end of a Science Lab Table. 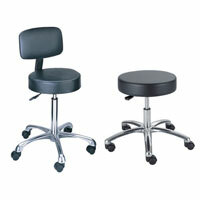 You don�t need to get up when you can glide smoothly over to where you need to be on a stool with wheels! Lab Stools, Medical Stools, Industrial Stools, and School Stools can all be enhanced if they have wheels on them to make mobility possible and convenient. Circulation Stools for Circulation Desks and High Top Reception Desks make it easy to adjust seats, adjust positions at the counter, and be comfortable for long hours. Ergonomic Stools and Stools with Foot Rests provide some comfort to hours of sitting that can be hard on your body. Enjoy the comfort and mobility that Plastic Mobile Stools and Padded Mobile Stools can give you. Try a Mobile Stool with Back Rests for even more comfort at your job!